GraceLinBlog: throwing my own party: why and is it worth it? So, after my rather elaborate book parties--the Porter Square and the online one--last week, fellow authors tend to ask me two questions. Why do I do them? Is it worth it? Well, a million years ago, I read online at the old Fuse#8 blog about an incredible book party that the publisher threw for the last Lemony Snicket book and there were two things I took away from it. First, I was kind of jealous. Why didn't any of my publishers every throw me even a quarter of a party like that? But it was about that time that I had begun to accept and find peace with Robert's illness. I began to realize that anger and resentment at not just his illness, but most things was simply wasted time and energy (which, consequently, is the theme of Starry River of the Sky). I realized, if I really wanted a party for my books I should do something other than stew in jealousy. So, then and there, I decided I'd stop whining and just throw my own fabulous book parties. Second, in response to that post at the Fuse#8 blog, one of the commenters criticized the extravagance and "waste of money" of the party, to which I remember (but can't find) she or someone responded about how all parties can be seen as a waste of money. The point of a party was to celebrate. The point of a book party is to celebrate the book with perhaps some promotional benefits--not the other way around. So, I probably lose money at my book parties. 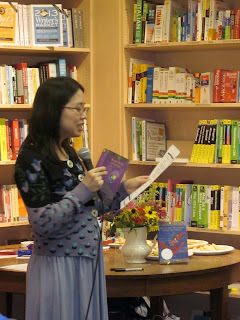 The magnets and chopsticks I had made for my Ling and Ting booklaunch most likely cost more than my royalty per book. The time spent made a hundred pocket pacys for my Dumpling Days launch probably put me at below minimum wage. This time around my awesome publisher (thanks, Little, Brown!) sprung for the glow-in-the-dark stickers and posters, but if they hadn't I would've paid for it myself. But it doesn't matter. Because these parties are also my way of thanking readers as well as celebrating the book. Booksales are like receiving presents at a birthday--I love them, but I wouldn't measure the success of the party by them. At my book party, I get to meet readers of my books, readers who want to read my next book! That is FUN. That is something to celebrate. And it is definitely worth a party.